Tempe city council voted earlier this week to institute penalties on drivers who are driving erratically, or cause collisions due to handheld cell phone use. Notably, the penalty for “aggravated” use — in the case where a serious injury or death occurs — is criminal. The ordinance is reproduced below. 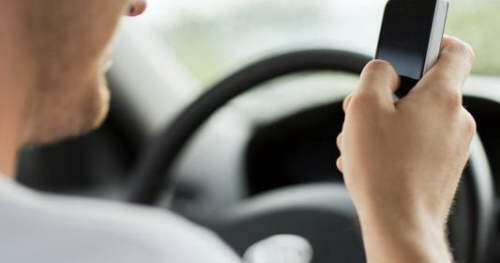 News item Tempe OKs toughest texting and driving law in Arizona. SECTION 19-55, RELATING TO UNLAWFUL USE OF A MOBILE ELECTRONIC DEVICE. Sec. 19-55. Unlawful use of a mobile electronic device. (a) It shall be unlawful for any person to operate a motor vehicle while using a mobile electronic device if such driving constitutes a risk to that person or others. No law enforcement officer shall issue a citation pursuant to this section unless the law enforcement officer observes or has credible evidence that the operator of the vehicle is involved in an accident or observes or has credible evidence that the operator of the vehicle is driving in such a manner that poses an articulable danger to that person or other persons on the roadway that is not otherwise specified in statute. (1) Mobile electronic device means any handheld or other portable electronic equipment capable of providing wireless or data communication between two or more persons or of providing amusement, including by not limited to a cellular phone, text messaging device, paging device, personal digital assistant, laptop computer video game, or digital photographic device, but does not include any audio equipment or any equipment installed to the motor vehicle for the purpose of providing navigation, emergency assistance to the operator of the motor vehicle, or video entertainment to the passengers in the rear seat of the motor vehicle. (2) Use or using means holding a mobile electronic device while operating a motor vehicle. (3) Hands-free accessory means an attachment, add-on, built-in feature, or addition to the mobile telephone, whether or not permanently installed to the motor vehicle, that, when used, allows the vehicle operator to maintain both hands on the steering wheel. (4) Operating a motor vehicle means operating a motor vehicle on any right of way including being temporarily stationary due to traffic, road conditions or traffic control sign or signal, but not including being parked on the side or shoulder of any right of way where such vehicle is safely able to maintain stationary. (6) A driver using a mobile electronic device while parked on the shoulder of a roadway. (d) Aggravated. A person commits aggravated use of a mobile electronic device when he or she violates subsection (a) and in committing the violation he or she was involved in a motor vehicle accident that results in great bodily harm, permanent disability, disfigurement, or death to another and the violation was a proximate cause of the injury or death. (e) Penalties. Any person who violates section (a) shall be guilty of a civil violation and shall be fined one hundred dollars ($100) plus penalty assessment for the first offense, two hundred fifty dollars ($250) plus penalty assessment for a second offense, and five hundred dollars ($500) plus penalty assessment for any subsequent offense within a 24-month period. Any person who violates section (d) shall be guilty of a Class 1 Misdemeanor. (30) days after adoption or at any later date specified therein. ARIZONA this ____ day of ________________, 2015.